Blatantly steal er, copy Stie's awesome idea that she stole borrowed from Alissa and posted about last year (but I was too lazy to make them). Thankfully, Stie posted a tutorial this year in plenty of time for me to get them ready for Cupid's delivery. 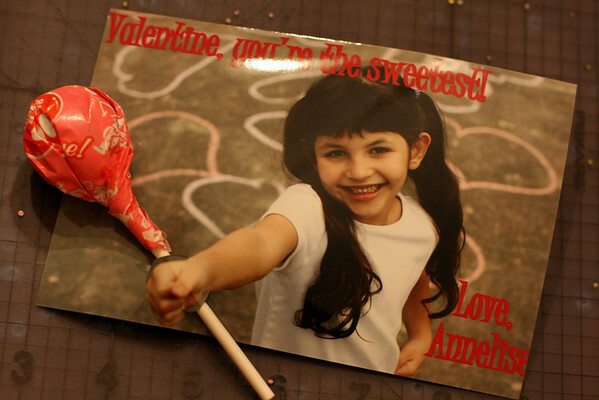 Of course, I didn't ask Annelise what she would like to make for her, you know, own valentines to pass out to, you know, her friends. Control freak much? Hustle Annelise outside to snap photos before the rain hits. 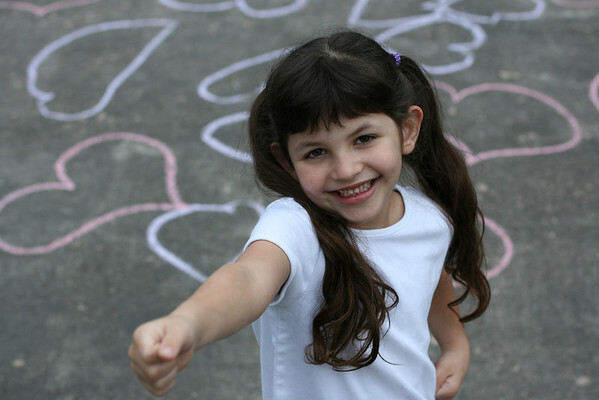 Decide to draw hearts (she helped with this part) with sidewalk chalk to make a slightly more festive background on the concrete. Ignore her confusion about why you are making her stand with her arm raised and hand clenched in a fist and take at least 30-40 snaps in the hopes of getting a keeper or two. 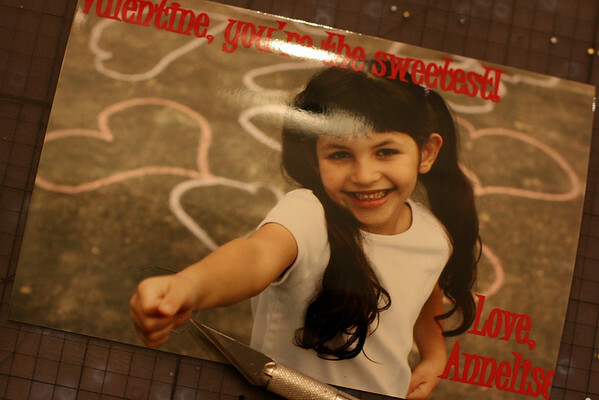 Add valentine greetings with your favorite photo editing program. I used Picasa since I was planning on ordering prints through Walgreens to pick up in the store and Photoshop Elements still makes me cry. Tip: more organized people might want to take their photo more than four days before the holiday in order to take advantage of mail order benefits (you can get heavier paper that way). However, I did get to take advantage of a Walgreens promo code and got 50 prints for $4.75, so YAY! for that. After picking up the photos from Walgreens, obsess for several minutes over the fact that the last letter of your sweet daughter's extremely long name has been almost cut off. Consider adjusting photo and re-ordering for a few more minutes. Eventually come to your senses and realize these will be given to children, who know her name anyway, and won't (fingers crossed) notice or care. Pat yourself on the back for talking said self off the irrational ledge once again. Use an Exact-O knife (be careful, my friends) and a cutting mat to cut a small half circle above and below your subject's clenched fist. I realize now I should have had Annelise hold her fist up a bit higher, but this still worked. Insert favorite lollypop into the opening and voila, you have now successfully created copied the easiest, coolest valentines evAH. You can put a piece of tape across the opening in the back if you'd like to secure the lolly, but it's fine either way. 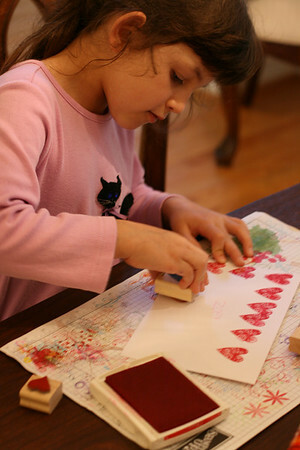 While I worked on the dangerous cutting part, Annelise participated in the making of, you know, her valentines, by writing names and stamping the envelopes (we used greeting card size). So, in a way, all in all, it was a team effort, right? Right?? ****I know my partial tutorial might be late for this year's valentines, but file it away in your brain for next year, m'kay? They turned out fabulous! Well done, you! I am so happy you made them. I love the hearts on the sidewalk idea. So, so clever. Holly, those are the cutest things ever! Precious!! Thanks for generously sharing your idea Christie!! You and Alissa are clever geniuses! Thanks Heather, um...did y'all check your mail yet???? Haha - we made these too!! I was laughing so hard with all the steps. I'll have to post Max's version, he wore his Indiana Jones hat for it. I LOVE your chalk heart idea! So cute. I did this too! They turned out so cute...I love your natural background! !